How do you find your food? Most animal species, whether they rummage through a refrigerator or stalk prey in the wild, obtain nutrients by consuming living organisms. Plants, for the most part, adopt a different feeding, or "trophic," strategy, making their own food through photosynthesis. There are, however, certain enterprising species that can do both: photosynthesize and consume prey. These organisms, found mostly in certain ocean plankton communities, live a flexible, "mixotrophic" lifestyle. 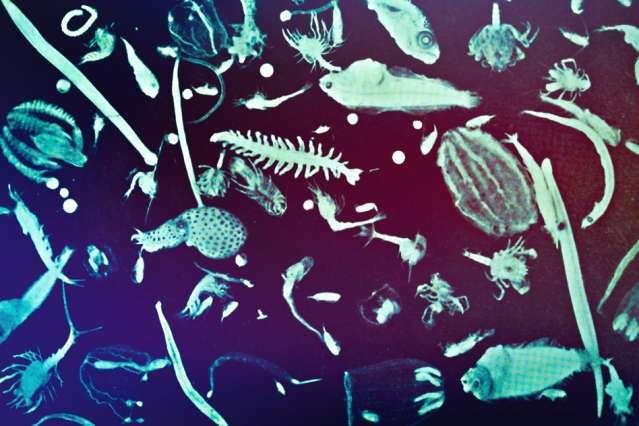 Now researchers at MIT and Bristol University in the United Kingdom have found that these microscopic, mixotrophic organisms may have a large impact on the ocean's food web and the global carbon cycle. The scientists developed a mixotrophic model of the global ocean food web, at the scale of marine plankton, in which they gave each plankton class the ability to both photosynthesize and consume prey. They found that, compared with traditional models that do not take mixotrophs into account, their model produced larger, heavier plankton throughout the ocean. As these more substantial microbes die, the researchers found they increase the flux of sinking organic carbon particles by as much as 35 percent. The results, says Mick Follows, associate professor in MIT's Department of Earth, Atmospheric and Planetary Sciences, suggest that mixotrophic organisms may make the ocean more efficient in storing carbon, which in turn enhances the efficiency with which the oceans sequester carbon dioxide. "If [mixotrophs] weren't in the oceans, we're suggesting atmospheric carbon dioxide might be higher, because there would less of the large, carbon-rich particles formed which efficiently transfer carbon to depth," Follows says. "It's a hypothesis, but it has been ignored in carbon cycle models until now, and we suggest it must be represented because it's potentially very important." Follows and his colleague Ben Ward, a former MIT postdoc now at Bristol University, have published their results today in the Proceedings of the National Academy of Sciences. Today's ocean models typically take an "either/or" approach, grouping plankton as either photosynthesizers or consumers of prey. This approach, Follows says, oversimplifies the processes taking place in the ocean that may ultimately contribute to how carbon moves through the oceans and atmosphere. He says mixotrophs are often overlooked, because our terrestrial experience makes them seem rare. "To us on land, we tend to think of [mixotrophs], like Venus fly traps, as exotic—they are a curiosity to us," Follows says. "Our traditional perspective is biased by the land, where organisms fall into one or the other category, rather strictly. But in the oceans, the more people have looked at plankton, the more mixotrophy seems to be common." The problem is that there are very few data to work into models, as it's extremely difficult to observe trophic strategies at the microscopic plankton scale. Therefore, models have largely left mixotrophs out of the equation and have instead looked to other marine processes to try and explain how much carbon is stored in the oceans. "It's like if we have a weather forecast model that gets the rain right in Boston today, but for the wrong reasons," Follows says. "If we use it tomorrow, we shouldn't expect it to do a good job, because it was cooked up for today. We want our climate model to be representative of the processes going on, in order to be predictive of how carbon storage responds to global change." As a first step, Follows and Ward chose to simulate a virtual world in which every plankton class is potentially mixotrophic. "It's a very idealized, black-and-white case: What's the maximum impact mixotrophs could have?" Follows says. In the oceans, plankton can range in size from less than 1 micron, to about 1 millimeter in diameter. Typical ocean models that incorporate plankton often group them in 10 general size classes, each of which fall into a "two-guild" structure, as either photosynthesizers, or consumers of prey. Instead, Follows and Ward made all of the plankton mixotrophic. The organisms in the model can photosynthesize, consuming inorganic nutrients. (The smallest organisms are the most efficient at acquiring those resources.) They can also eat other plankton and are constrained to consume prey in size classes about ten times smaller than themselves. "After we have built in these rules for the system, whether each size class lives largely by photosynthesis or largely by predation depends upon the availability of each type of resource and their relative ability to harvest them in each environment," Follows says. After running the model forward, the researchers compared the results to those of a traditional model without mixotrophs. They found both models showed a general feeding structure throughout the plankton food web: The smallest organisms were too small to ingest prey, while the largest plankton were poor competitors when living by photosynthesis. However, where the traditional model made a strict separation between those that photosynthesize and those that don't, the mixotrophic model blurred those lines, with some smaller organisms consuming prey and some larger ones being able to photosynthesize. The result was that mixotrophic organisms in every class increased the average size of that organism, creating larger and heavier plankton throughout the oceans. These more substantial organisms, compared to smaller and lighter plankton, were more capable of sinking to the ocean floor, as carbon-containing detritus. "It essentially means that, through multiple means, in a world with mixotrophs, more organic carbon is sinking into the deep ocean than in a world without mixotrophs," Follows says. The team's estimate of the amount of sinking carbon contributed by mixotrophs appears to agree with recent observations of carbon flux by mixotrophic plankton in the North Atlantic. Follows says that, with more data on these opportunistic organisms, he hopes to improve the model to accurately reflect mixotrophic populations and their effect on the planet's carbon cycle. "Part of our hope is for the work is to give some wind to the sails of these observational studies. We think they're very valuable," Follows says. "There may be a large fraction of grazing that is being done by mixotrophs, so it's potentially very significant in terms of the flow of carbon in the ocean and it should be quantified."